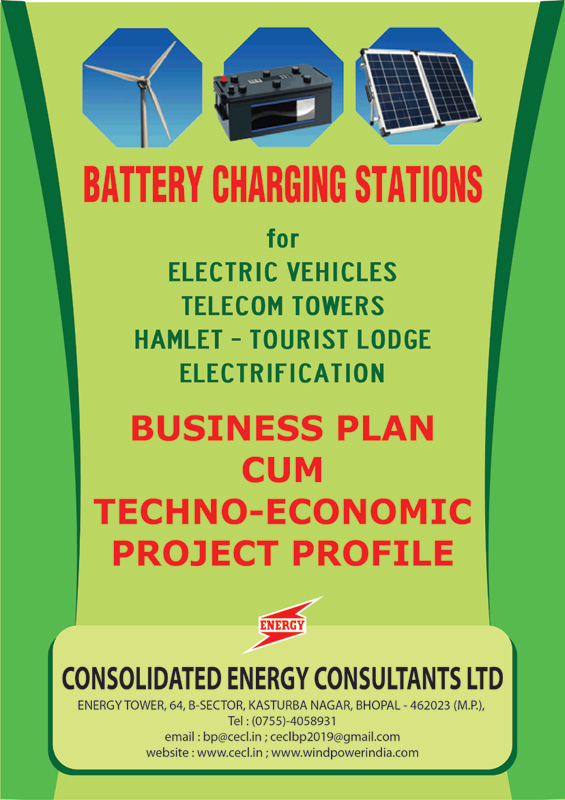 Electric Vehicles, Telecom Towers and Tourist Lodges in Scenic Spots. Presently the demand is met through Diesel Generating (D.G.) sets – which is exorbitantly costly and highly polluting. Conventional electricity grid is either non-existent or unreliable and erratic. Local Renewable Energy (RE) sources like Wind or Solar or may be hybrid combination in decentralized locations can generate electricity. 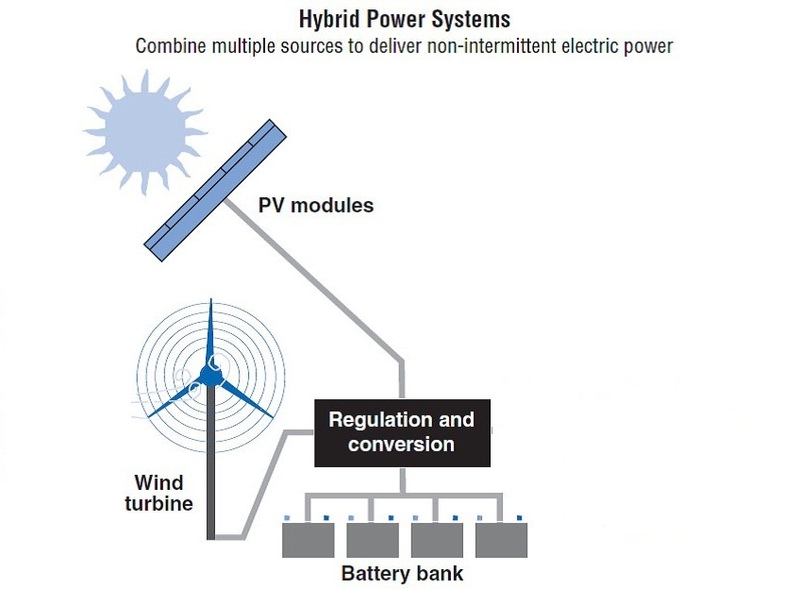 The variable wind or solar energy produced needs to be stored in Battery to meet the requirement on demand. These are small but modular in nature to produce from Watt to Kilowatt and even Megawatt. Engineers/ MBAs/ Graduates can now start their own business as "SERVICE PROVIDERS"
To produce pollution free electricity through RE sources. Store it in Battery Bank. Deliver the energy when and where it is needed. It is a composite service - which will be in high demand particularly in rural / remote area. This Business venture becomes instantly viable and profitable since it shall be replacing the prohibitively costly electricity produced by DG sets which varies from Rs. 30/- to 40 /- per kWh unit. The steady electricity supplied through Battery Bank would cost between Rs. 20/- to Rs. 25/- after consideration of cost of generating plants, extra cost of storage and profit/ earning of Entrepreneur. The profitability shall vastly improve at sites/ locations where wind/solar resource is high. It is a project in priority sector – and in virgin field with hardly any competition – as also cash income to ensure loan servicing. Consolidated Energy Consultants Limited (CECL) is a highly reputed consultancy firm with more than three decades of experience in providing Turn Key Technical Services for Wind-farm Projects. We have provided services to 350+ Clients for 600+ Projects. The client base includes national, international - government, private and PSUs and banking institutions and organizations. CECL has been publishing encyclopedia "Directory Indian Wind Power" for past 18 years. Should you need to know more about us, please click here or go to cecl.in now. So much so on our technical expertise and experience. Now on our financial integrity you shall be amazed to know that we have a Joint Sector Company - M.P.Windfarms Limited (MPWL) where we own 51% Share Holding and Government of India owns 24%. MPWL is the only Company in India - where Government of India is a minority Share Holder. This comprehensive report would be available online @ Rs. 4928/- only on full advance payment. This would be supplied only to limited few on Advance Booking basis. You have to register and make payments to be made online. By Demand Draft favouring "Consolidated Energy Consultants Limited" payable at Bhopal. Your orders must be placed on or before 29th April 2019 alongwith advance payment to CECL vide our portal. When would it be released? The Published report shall reach you by email after 06th May 2019 on release of the report.